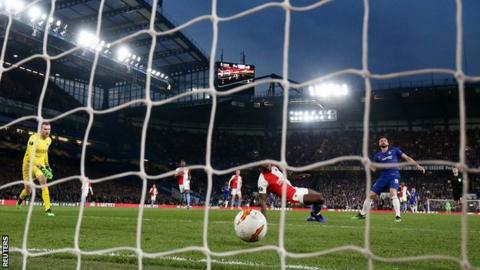 Manager Maurizio Sarri says Chelsea's slow starts to the second half of matches are becoming a "big problem", after they were forced to withstand a Slavia Prague fightback before reaching the Europa League semi-finals. Chelsea were cruising at half-time with a four-goal aggregate lead before Petr Sevcik produced two sensational strikes as the nerves crept into a previously dominant performance at Stamford Bridge. The Blues also conceded early in the second half of their loss to Everton last month, as well in their victory against Cardiff on 31 March, while just last weekend Liverpool hit them with two goals in eight minutes at the start of the second period as they fell to a Premier League defeat at Anfield. "We played very well in the first half, but as usual in the last two months, we started very badly in the second half," said Sarri. "Probably at the end of the first half we thought we had qualified and against this opponent it was not true. "I could try without going in the dressing room at half-time if I could solve the problem. "We need a solution but I'm really really happy because we played well in the first 45 minutes and we are in a European semi-final which is very important to us." Having secured a valuable 1-0 advantage in the Czech Republic, Chelsea raced into a three-goal lead in west London courtesy of goals from Pedro, Olivier Giroud and a calamitous Simon Deli own goal. Slavia captain Tomas Soucek headed in his side's first goal before Pedro doubled his tally just 63 seconds later. Sevcik's double changed the mood and, buoyed by their noisy supporters, the visitors pushed forward as they tried to force a way back into the game before time defeated them. Chelsea travel to Germany for the first leg of their last-four tie with Eintracht Frankfurt on Thursday, 2 May. Chelsea lost ground in the race for the top four in the Premier League with that defeat at Liverpool on Sunday, but as Sarri indicated before kick-off, the Blues were solely focused on the job in hand during the opening period against Slavia. They were dominant from the first whistle, exploiting the visitors with clinical accuracy and scoring four first-half goals from four shots on target. They took a third-minute lead with a fluid move down the right involving Cesar Azpilicueta before Pedro played a neat one-two with Giroud to streak clear and lift the ball over goalkeeper Ondrej Kolar. It was 2-0 moments later when Pedro struck the post after Eden Hazard flashed the ball across the face of goal, only for Deli to helplessly divert the rebound over his own line from close range. Giroud rolled in his 10th goal of this season's competition to extend the lead before Soucek pulled one back, but Pedro's second restored a three-goal lead on the night. Sarri's side lost their rhythm after the break and only mustered two shots at goal as Slavia stepped up their intensity. Sevcik unleashed two similar strikes with his potent left foot, beating Kepa Arrizabalaga first at his near post before then finding the top corner with a stunning effort five minutes later. Chelsea's mini-capitulation had echoes of their display at Anfield on Sunday but the Blues had useful cushion to protect them on this occasion. Victory ensured Chelsea became the first English club to win 11 matches in European competition in a single season, but Sarri must help his players to find consistent displays for the whole game if they are to deliver a first European trophy since 2013 - and with it Champions League football next season. With 45 minutes played, Slavia were staring at a humiliating defeat by a confident Chelsea attack, but they will be encouraged by their second-half performance as they chase the Czech league title. Jindrich Trpisovsky's side are five points clear with two games to play in their domestic league, and they are clearly capable of competing against some of Europe's big hitters. Slavia posed a threat from set-plays as Deli almost scored their first goal with a powerful header before Soucek opened their account. Chelsea struggled with their aerial power and physicality as the visitors produced more shots over 90 minutes (11) than the hosts (9). Sevcik's terrific left foot almost initiated a memorable comeback, but Slavia exit the competition with their pride in tact, having scored four goals against the Premier League's fourth best defence, and claimed impressive victories over Genk and Sevilla in the knockout stages. Chelsea defender Cesar Azpilicueta, speaking to BT Sport: "It is a mistake we are making very often and we are conceding early goals in the second half of games. We were 4-1 up but they put us in trouble and we were risking it. We were suffering until the end. "It is not the way we want to win the trophy but we are in the semi-final and hopefully we can get through." Chelsea are the first English side to win 11 major European games in a single season. Slavia Prague are winless in their last nine European meetings with English clubs (W0 D2 L7) since winning 2-1 at home to Leeds United in March 2000 in the UEFA Cup. Chelsea have benefited from five own-goals in all competitions this season, of Premier League clubs, only Man City (7) and Arsenal (6) have benefited from more. Pedro has been directly involved in three goals in a European match for the first time in his career (2 goals, 1 assist). Chelsea's Olivier Giroud has been directly involved in 13 goals in his last nine Europa League appearances, scoring 10 and assisting three. Olivier Giroud is the first Chelsea player to score 10 goals in a single season in European football.